For homeowners who love gorgeous, natural-looking decks, the choice comes down to wood decks vs. composite decks. What’s the difference between wood and composite decking materials and which one should you choose? We’ll keep it short and sweet: in the battle of wooden decks vs. composite decks, composite is better than wood in every way — and it isn’t even a close call. Why does composite score such a shutout victory over wooden decks? Let’s break it down, point-by-point. What is the Difference Between Wood and Composite Decking Material? Wooden Decking: The traditional material used to build decks and porches, wood has its upsides and downsides. Wooden decking can be painted and stained in a variety of different hues and colors, yet it always retains the distinctive look of wood. Composite Decking: A precise blend of real wood and plastic polymers, composite decking has the appearance of real lumber, but without any downsides. Capped composite decking, the type of composite material used by Keystone Custom Decks, wraps a barrier of vinyl around the composite core. No matter what you do to wood — paint it, stain it, or seal it — it will always splinter. That’s just the fact of the natural product. On the other hand, the durability and strength of composite decks mean that they will NEVER splinter. 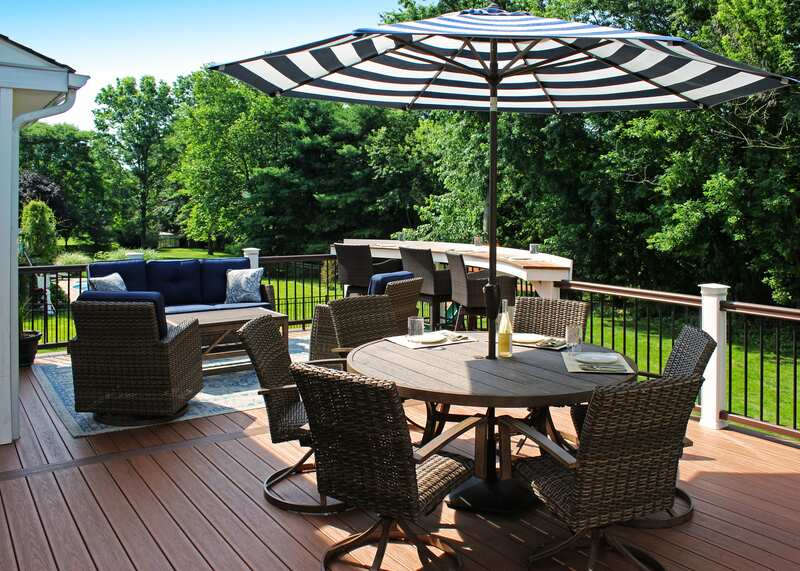 Imagine that you and some friends are enjoying a few glasses of red wine on your deck. Someone spills a little. Disaster or no big deal? On a wooden deck, that wine stain will last FOREVER — at least until you paint over it. On a composite deck, you can wipe up the wine or let it dry, because composite decks are impervious to stains with proper deck care. Even famously-permanent red wine stains don’t stand a chance. As bona fide deck experts, we have seen time-and-time-again that mold can kill a beautiful deck. If you’re planning on enjoying your deck for decades to come, you need to protect it from mold. Mold can and will grow on ANY surface, regardless of how tough — even composite decking. What separates wood decks from composite decks is what happens after the mold starts to form. If mold grows on the surface of a wooden deck and isn’t cleaned immediately, the fungus can penetrate the wood, spread, and destroy the entire deck. In a matter of months, your deck will be completely ruined. On the other hand, if mold grows on the surface of a capped composite deck, it’s harmless — other than looking gross. Clean up the mold at your leisure. Not only do you want to be able to enjoy your deck for decades, you want to enjoy the original color. The exact shade you picked out to match your home. The sun and the elements cause wooden decks to lose their original color over time, turning it into a sickly and pale shade of grey. Unfortunately, there’s nothing you can do about it — all of the stain and finish in the world can’t keep a wooden deck from going grey. Composite decks may look gorgeous like wood, but they don’t possess all of the wood’s weaknesses. Composite decks keep their color over their entire 50+ year lifespan. Owning a wooden deck is like having a part-time job in your backyard. At the minimum, you’ll need to refinish your wooden deck every year, maybe twice. The only thing that investment of time accomplishes is preventing the boards from rotting out. Yet if you neglect it, you won’t get the expected lifespan out of your deck — not even close. On the other hand, composite decks are extremely low-maintenance. All you need to do to keep a composite deck looking great is power wash it once a year — no staining or sealing required. We’d say, set it and forget it — but it’s more like: set it and love it! Spending day after day baking in the hot sun has an effect on your deck. Wooden boards will noticeably warp over time, whereas composite deck boards stay strong. All of the best showpiece backyards coordinate the color of the home with the color and style of the deck. When you build with composite, you have nearly unlimited options for color. If you want to mirror the cool, modern tones of your siding, you need a cool charcoal colored deck. On the other hand, if you’re crafting an earthy and rustic feel, you’ll need your deck to complement that. Composite decking is the only choice when style is of the essence. Wooden decks basically come in just two colors: light and dark. Sure, these decks are gorgeous, but the style is pretty limited, too. Here’s the final kicker too: composite decks can even be made to look indistinguishable from wood. Like the sound (and look) of composite decking? You’re in the right place. Keystone Custom Decks is one of the east coast’s premier deck builders, and composite decks are our specialty. Did your jaw drop, seeing some of these gorgeous custom decks? We’ve got more where that came from. Explore our gallery of nearly 200 showpiece composite decks — and let your imagination run wild! When you work with Keystone Custom Decks, you have a team of designers and craftsmen working to bring your dream deck to life. Start a conversation and get your quote today!